Affordable slicing with an offset handle. The Jaguar Pre Style range is priced for affordability while offering German-engineered stainless steel blades and a high quality build. 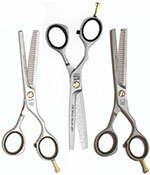 That combination has made them firm favourites with students and qualified hairdressers alike. Now Jaguar have produced a Slice version so you can take your cutting to the next level. That's thanks to the hollow-ground and honed blades (rather than the micro-serrated blade on the standard version) that make for easy slicing. The Jaguar Pre Style Relax Slice features a short thumb handle which gives it an offset shape. This helps to relax the hand when you're cutting reducing the likelihood of strain and tiredness. There's also a removable finger rest and finger rings included for your comfort. 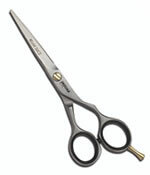 The Jaguar Pre Style Relax Slice comes in 3 sizes: 5, 5.5 or 6 inches. Not yet ready to slice? Find the standard Pre Style Relax here. 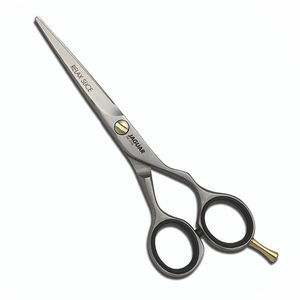 Designed with offset handles for a relaxed hand position when cutting the Pre Style Relax is made from stainless steel and features 28 teeth with one blade micro-serrated for easy cutting. Comes in either a satin Matt finish (left or right handed) or a gleaming Polished finish (right handed only).